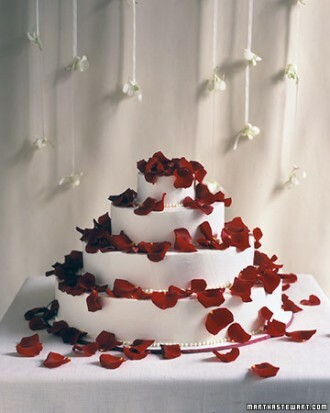 I absolutely love this cake and how the stark white icing is accented by the rose petals. The cake itself is beautiful and elegant with the small pearls piped around each tier. And the rose petals look like they fell from the sky and landed gracefully on the cake. In reality, I’m sure they were all painstakingly placed to make them look as though they were cascading from the top of the cake. Whatever the trick was it totally works here. This is one of the prettiest – and simplest – cake designs I’ve found in a while. I think it would be perfect at a Valentine’s Day wedding, but would also work at other times throughout the year. You could probably create a similar look with pastel rose petals for a spring wedding! So the only question left to ask is this: Will you accept this rose (covered cake)? If the answer is yes, you can find this lovely cake here.